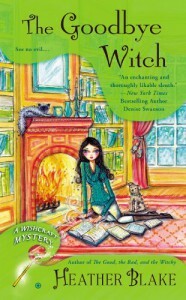 The Goodbye Witch - Heather Blake - review - What is Kimberly reading now? Was it me, or did this book give the feeling that this was the end of this series? I know that isn't true because I quickly went to Heather's web page and saw that the next book comes out in May 2015. Phew! I think I would have pitched a fit if that weren't the case. I don't know what to say about this book, the author and the series that already hasn't been said. Personally, I get a content, warm fuzzy feeling while reading the book. I don't put the book down even when I have to do the laundry or clean my kitchen. Glinda! What the hell? She needs a hobby. Or a couple of drinks. If anyone knows who The Elder is, please PM me. I thought I knew, then that didn't pan out. Now I think I know who it is and I want confirmation. Of if anything, someone to speculate with!